Marketing guru Philip Kotler has been asked just about every question on marketing that has ever crossed the lips of an inquisitive marketer. In According to Kotler, he answers the most common of those questions in a question-and-answer format that makes it easy for those with marketing inquiries to find the solutions they need to face just about every marketing dilemma. By organizing the questions he answers around a variety of subjects, including strategy, planning, organization, control, brands, areas of application and excellence, Kotler helps readers to quickly access his expert advice. 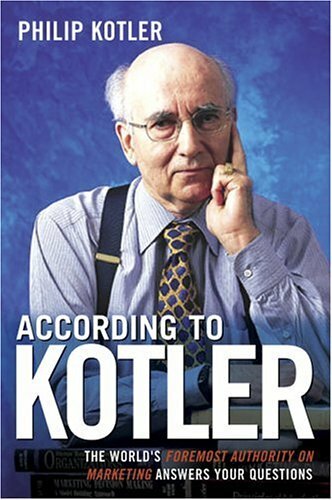 Starting with the broad strokes, Kotler begins According to Kotler with questions and answers about markets and marketing. This section includes the question, "What is marketing?" to which Kotler replies, "Marketing is the science and art of exploring, creating and delivering value to satisfy the needs of a target market at a profit." He adds that the fact that marketing is often performed by a department within an organization is both good and bad: good because it brings together trained people who focus on the task; bad because marketing activities should be manifest in all the activities of the organization. Hire more people with a creative bent, whose minds are more free-wheeling, more curious and more questioning. Employ creativity tools and processes in the course of solving company problems, such as brainstorming, synectics, modification analysis, forced relations and morphological analysis. Occasionally hire the services of a creative agency that offers to help generate big new ideas. Next, Kotler digs into the main tools of marketing, which are product, price, place and promotion. While exploring these "4 Ps," Kotler answers the question, "How do you build a brand?" with one of the shortest of the short answers he provides throughout the book. Essentially, he writes that this question is best answered by reading a book by any number of other marketing experts, including David Aaker, Jean Noel Kapferer and Scott M. Davis. When answering the question, "Do you think that global brands can be developed in smaller countries?" Kotler points out that country size is not that important. Sweden, a country with only 5 million people, is the home to Volvo, Saab, Electrolux, Ericsson and Sandvik. Switzerland, a country with only 9 million people, has Nestlé, Swatch, Rolex, ABB, Hoffman LaRoche, Bauer and many other highly visible brand names. On the other hand, many large countries, such as Russia, India, China and Brazil have very few global brands that have reached mainstream America. Questions about marketing planning, organization and control come next, followed by those about marketing application. Issues covered in this section include consumer packaged goods, retail marketing, small business marketing, direct marketing, Internet marketing and just about every other form of marketing yet devised. When answering the question, "Will online marketing make some retail stores superfluous?" Kotler explains that the Internet will be a curse to some retail sectors, including travel agents, insurance agents, bookstores and music stores. "Store managers need to start figuring out how to make their stores more interesting to customers. Instead of simply carrying products, they must think about how to design a more satisfying store experience." The final section of According to Kotler delves into questions about marketing excellence and the ways that the best companies have found to become more effective. Here, he lists companies that have appealing and innovative marketing strategies that have either dramatically reduced customer costs, such as IKEA and Southwest Airlines; dramatically improved product quality or customer experience, such as Starbucks and Sony; or reinvented the nature of their business, such as Barnes & Noble and FedEx. Two great things about According to Kotler are its no-fluff answers to pertinent marketing questions and its extensive index that makes finding the right answers as easy as searching for a topic and finding the page where it resides. By putting his vast wisdom into a highly usable resource, Kotler has made better marketing even more accessible. Mar 12 Things you need to know about the book " Passion and Purpose"